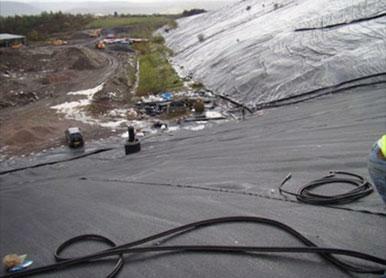 HDPE / LLDPE grids are used for the purposes of encapsulating compacted landfill to control methane gas emissions and leachate leakage. Bryn Pca is a Landfill site which channels the methane gases produced from decomposition of biodegradable waste. The waste gases are turned into green electricity by burning the waste gases. Anchor Systems (International) Ltd were requested to design a Landfill Anchor for the purposes of fixity and containment. Celtic Lining Ltd called upon Anchor Systems (International) Ltd to supply a viable anchoring system that would provide a good method of anchoring as well as arresting escaping gases and leachate. Anchor Systems proposed the Aluminium Earth Anchor with associated parts that provide fixity. A capping plate was proposed to ensure management of any escaping gases after the anchor had pierced the HDPE cover. The capping plate cover also provides barrier protection against the egress of leachate into the local watercourse. With the aid of Anchor Systems (International) Ltd bespoke hand held installation equipment the linings were anchored within 3-4 days to the compacted waste below to ensure that methane is channelled through the vertical pipes positioned in the landfill to a gas processing facility on site. Anchor Systems (International) Ltd has now successfully supplied this system in 7 phases over the last 4 years to this site. This a testament to the capability of the Anchoring System proposed in providing suitable conditioning for the linings.